Warm, moist soil, well-enriched with organic matter. 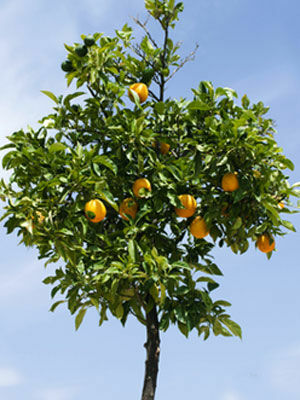 Oranges grafted onto a dwarfing rootstock may be grown in containers. A sheltered spot in full sun; grow in a frost-free spot under cover from autumn to early summer in cooler areas. No. Grow at temperatures above 7°C (45°F). In spring, summer and autumn feed with a high nitrogen fertiliser. Yellowing leaves indicate a need for more nitrogen. Lavender and Garlic. Oranges and other citrus are heavy feeders that resent close company. Grow in containers of rich compost to keep plants compact and to make it easy to bring plants indoors for the winter. Good drainage is essential. Start small plants in containers at least 30cm (1ft) wide and pot them up a size yearly until they reach mature size. Prune in spring or summer. Pick when richly coloured and fully ripe. Picking can continue for several weeks as fruits do not ripen all at once. Grow outdoors in the warmer months to expose plants to heat and pollinators and to avoid most pests. Soft soap sprays can help against scale insects.